The purchase of Randolph County birth, death, and marriage records is restricted to family members for 100 years following a birth and 50 years following a death or marriage. After that, these records are public records. They can be purchased from the state Vital Registration Office. The Randolph County Clerk maintains pre-1917 records and all divorce records. 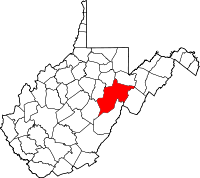 Randolph County was created in 1786 from Harrison County and named for Edmund Jennings Randolph, George Washington's aide-de-camp during the Revolution. Although he rejected the Constitution, he became Governor of Virginia, US Attorney General, and US Secretary of State. The world's first 4-H camp is in Randolph County.